This is the most common solution chosen by companies. With added multimedia functionality, agencies can offer your customers FlipBooks with interactive advertising and presentation ability. 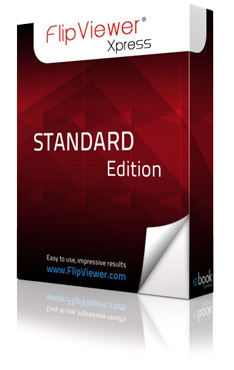 This version offers a comprehensive feature set, and builds on the functionalities of the Basic Edition. With advanced personalization features, magazines can be perfectly adapted and presented with your customer's corporate design. Brands and logos convey emotions and have a unique recognition. You are allowed to customize your own Book Loading logo other logos in the user interface itself. While individual FlipBook pages are being loaded, you can define the "page loading" image. Whether it is logos, slogans or product visuals, you can be creative. In many websites or marketing materials, icons, buttons or visuals are usually designed for good brand recognition. In this case, you can replace each button of the user interface with a different image of the same size to fit the corporate design. You can move the main navigation bar from the top to the bottom of the FlipBook to give a more personalized appearance. We have reserved an area for flash-based advertising next to the front and back covers of the FlipBooks. To make it an attractive marketing area, we also provide the functionality to dynamically swap the advertising contents. With the video tool, you can easily add your own videos or movies from YouTube to the pages of your FlipBooks. Custom animations or interactive features, designed as an SWF file, can be easily added as a source file and integrated into the FlipBook. Enhance the contents with other interactions and animations. This can be done as usual through the integration of Flash ActionScript 2 and 3 functions. Integrate the link between the products in the FlipBook and an existing webshop.